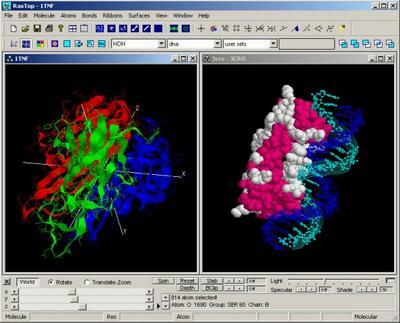 RasTop is a molecular visualization software adapted from the program RasMol initially developed by Roger Sayle. RasTop wraps a user-friendly graphical interface around the "RasMol molecular engine". The software allows several molecules to be opened in the same window and several windows to be opened at the same time. There is no need to type on the command line; each command in the menu generates its own script. Through an extended menu and a command panel, users can manipulate numerous molecules rapidly and learn about them. Work sessions are saved in script format and are fully regenerated with a simple mouse click.